People say you never know what you have until it’s gone. Right now I realize I didn’t appreciate the tropical weather we lived in for the past 5 years. 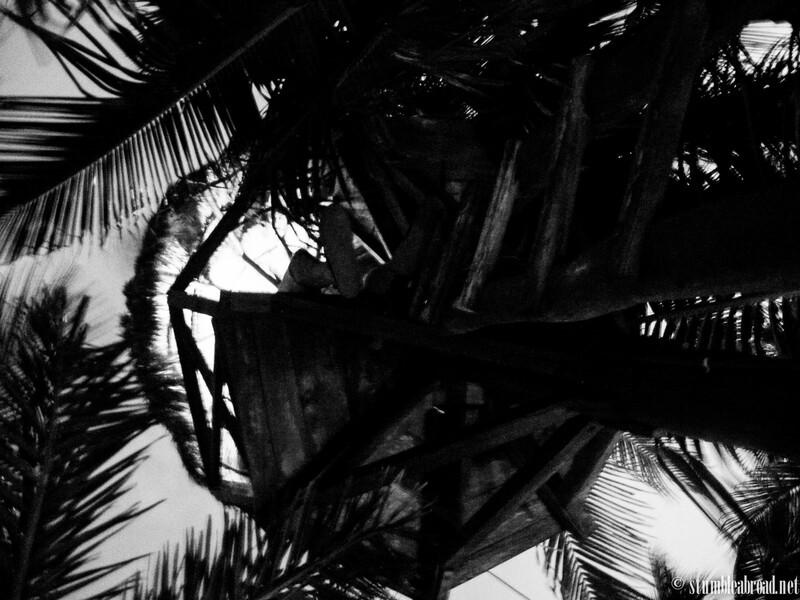 As the winter in Virginia refuses to subside and we are yet again stuck home due to a snow day, I can’t help but dream of the warm breeze of Thailand, Indonesia and even more so Mexico. 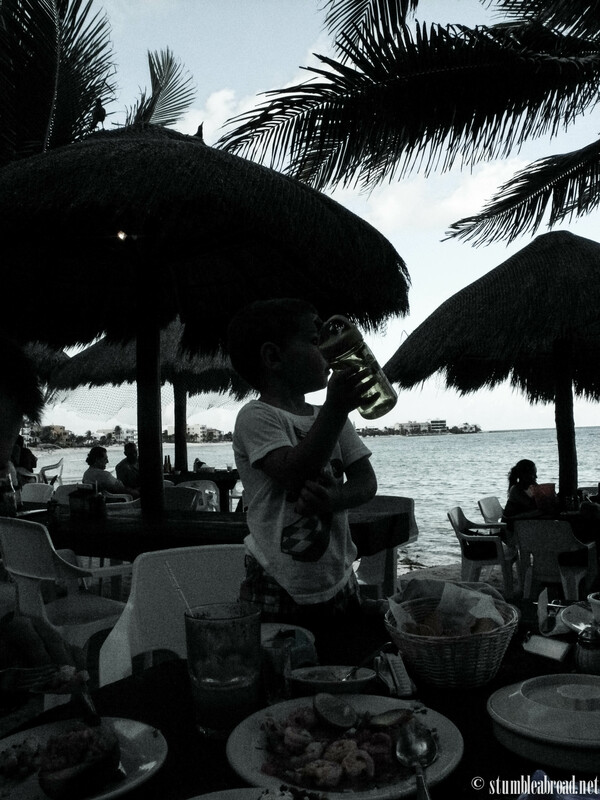 When we visited the Riviera Maya with the kids a couple of years ago we decided to take it slow and enjoy the beach as much as possible. 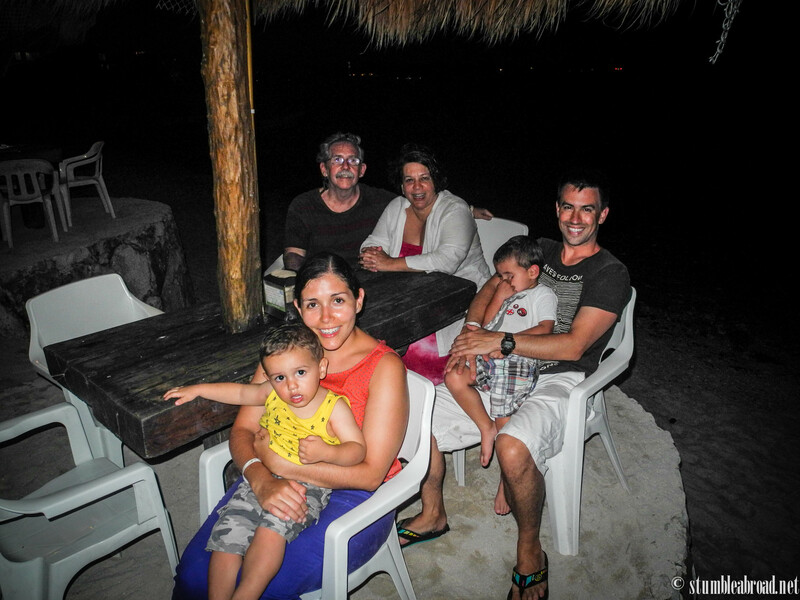 We were lucky to travel with my parents so they stayed with the boys when we went diving. 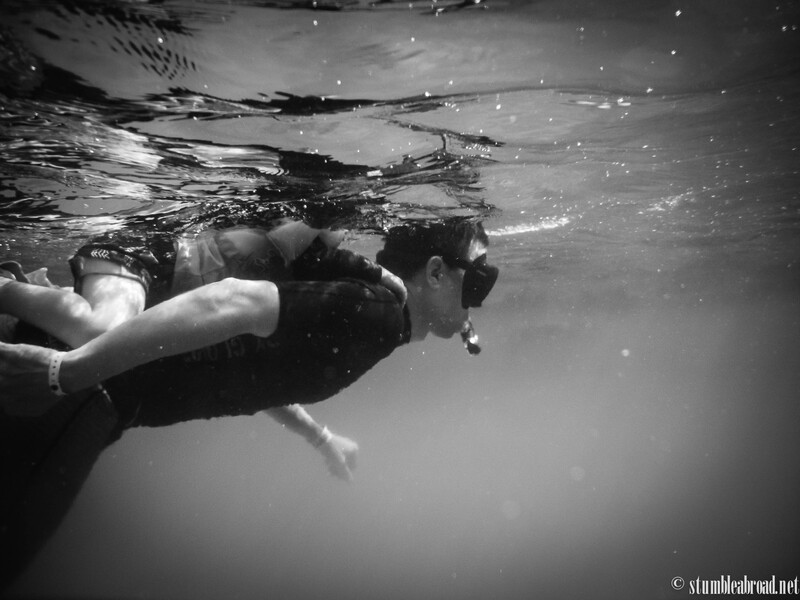 When we plan our diving trips, we always leave a couple of days at the end of the trip to decompress. 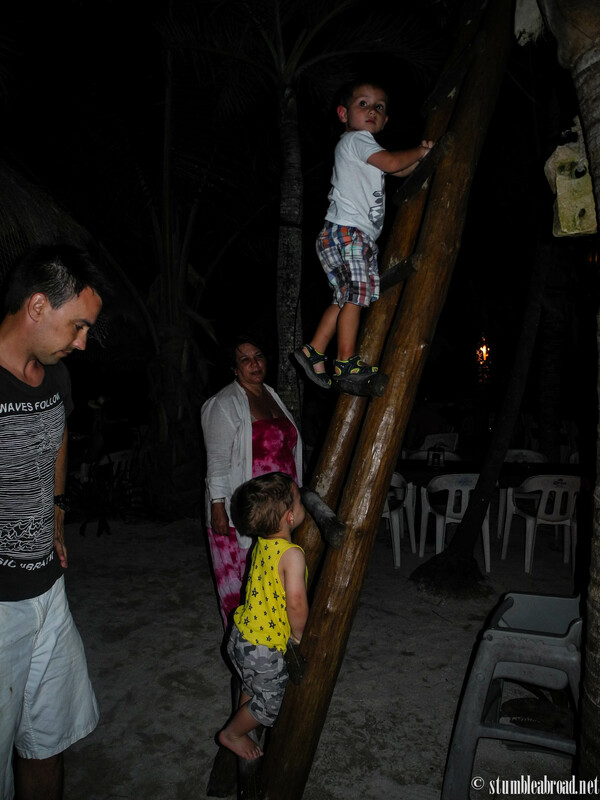 We try to do a bit of sightseeing and relax and enjoy time together as a family. The day we visited Tulum with my parents and the boys we decided to take advantage of the fact that we were already on the road and started looking for places nearby to check out. A bit of travel app searching later we decided to go to Akumal. 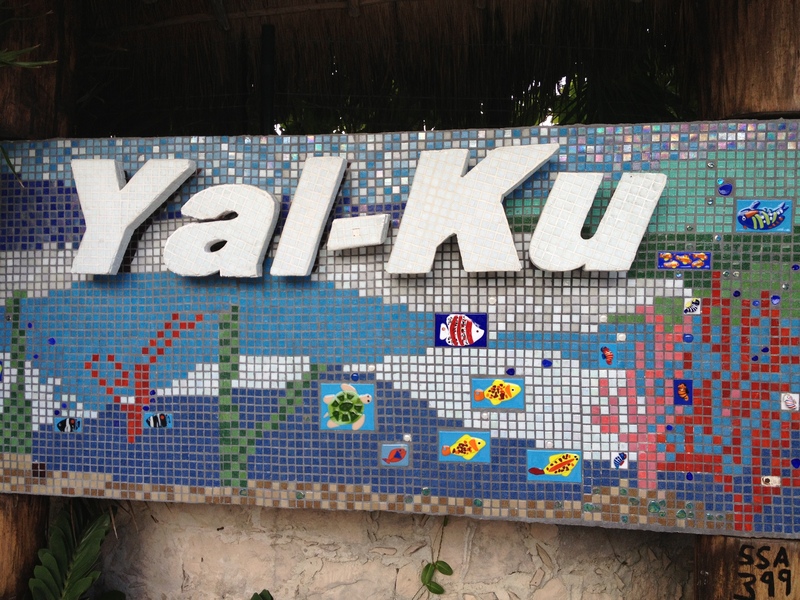 I had been to Akumal many years ago on a trip with my girlfriends. I remembered I loved the beautiful water and soft sand. 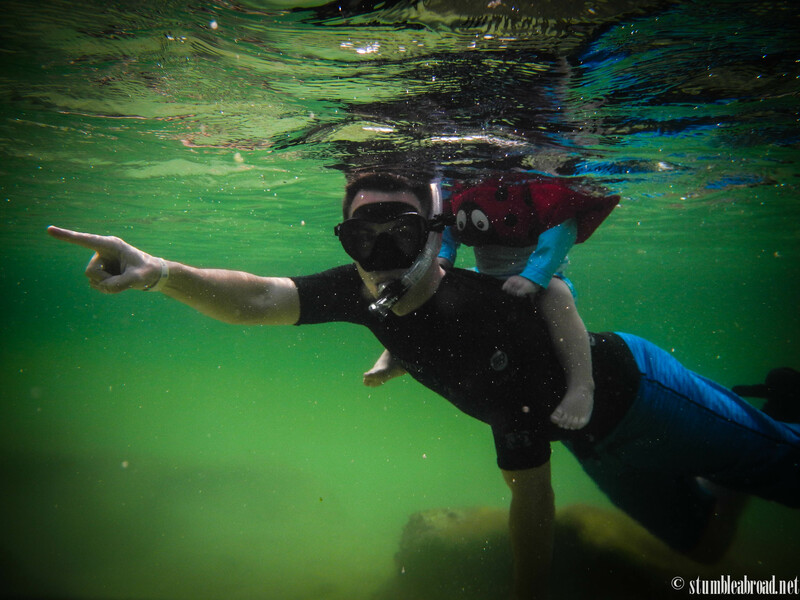 This time we wanted the boys to catch a glimpse of what mommy and daddy see when we scuba dive so we decided to visit a lagoon where the kids could snorkel with us. 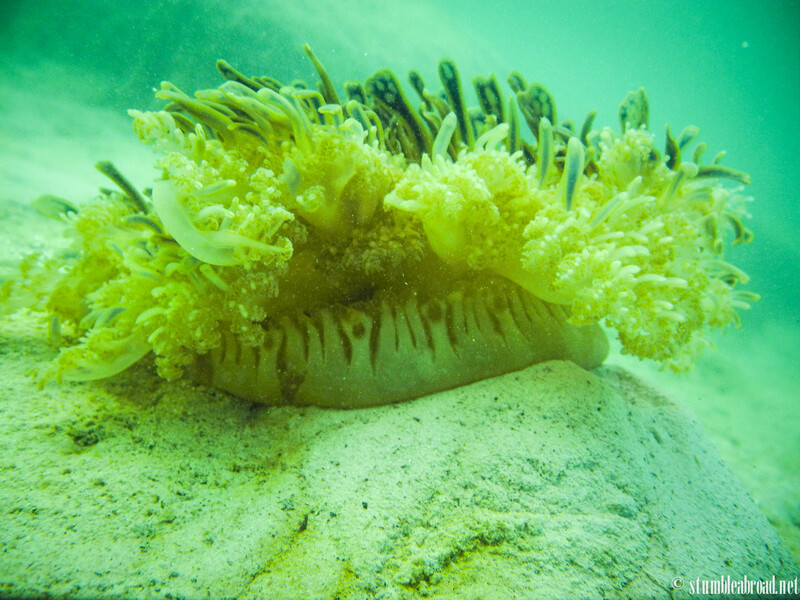 The Yal-ku lagoon has become a very popular venue for people looking for a place to snorkel and spend the day. 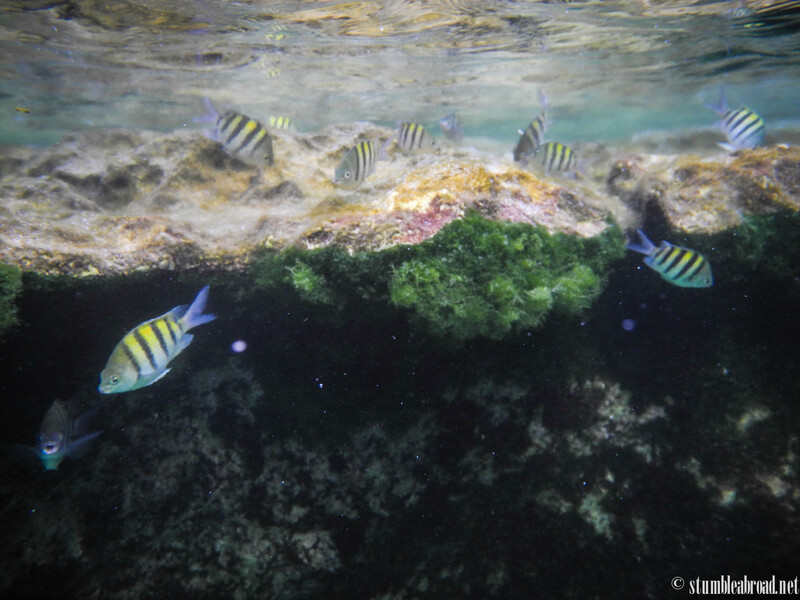 Since we had a full day of exploring we thought a couple of hours swimming would be plenty for the kids to see some fish and for us to get a bit wet after a long day under the sun. Due to our late arrival we were able to get a special afternoon price. We went in conscious we wouldn’t be there for long but determined to have a good time. The Yal-ku park is very well taken care of. The gardens are perfectly manicured and the management strives to keep the site as eco-friendly as possible. We left our stuff on one of the hand-made benches by the water and hopped in. Evan was very excited and jumped right in with daddy. Within seconds he was pointing at the fish and excitedly trying to reach them. Josh wasn’t as excited but enjoyed getting wet. 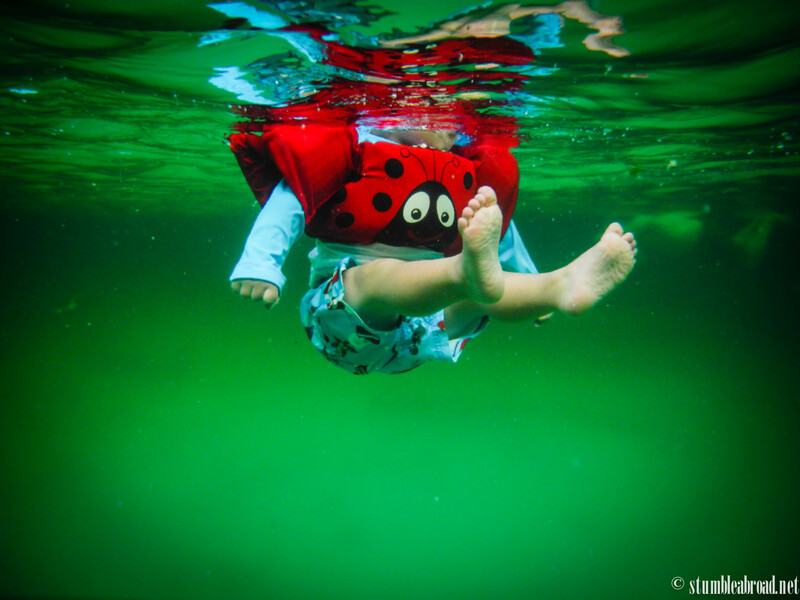 I see fish, and Joshua’s feet! Evan and daddy dove away and I stayed with Josh and my parents. I had such a good time swimming with Josh and realized I need some practice on my kid water transport skills. 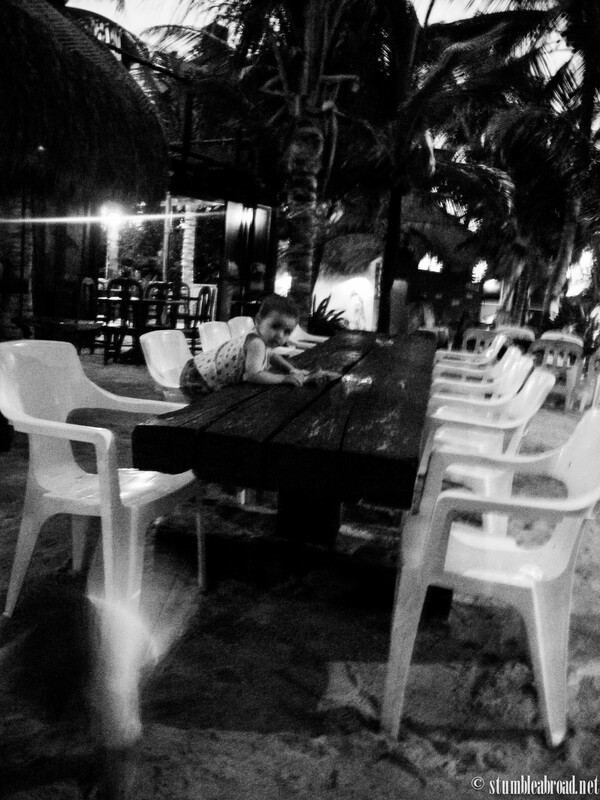 After a nice refreshing swim Evan and Josh were ready for tacos and mommy and daddy were ready for a Margarita or two. We took a quick shower and got our stuff in the car. Again we just looked on different travel apps to look for a good restaurant nearby and found a place that seemed to have everything we were looking for, including a playground for the boys! 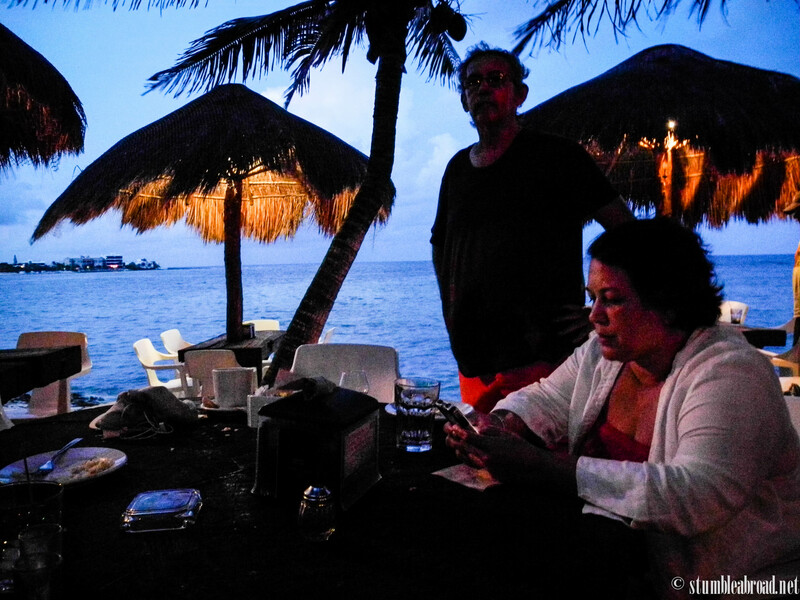 La Buena Vida restaurant was the perfect spot for us to relax after a long day touring around. The food was delicious and the atmosphere very fun and relaxed. 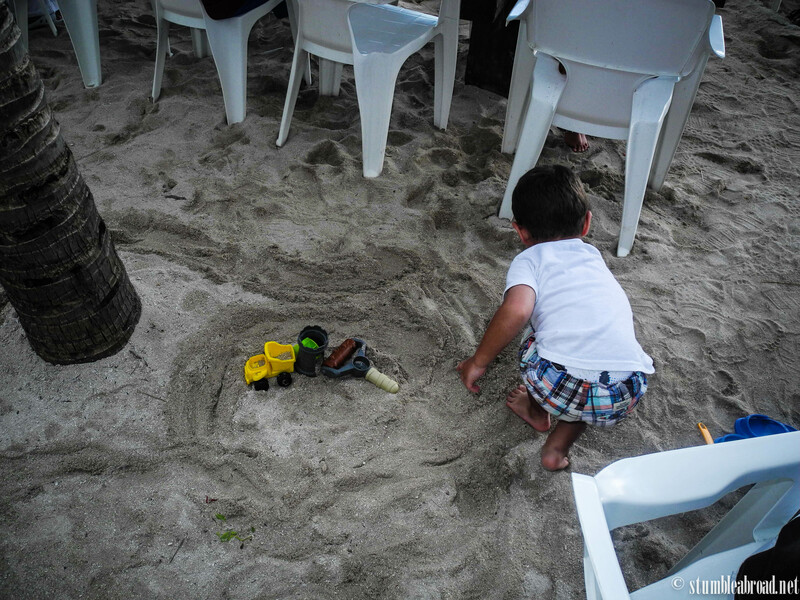 We noticed lots of families hanging out and the boys were excited to have their sand toys with them. I was relieved to have their stuff in the car as sand toys seem to be the perfect entertainment and fight appeaser. Josh was starting to test his boundaries and chose to switch families a couple of times. We had some fresh fish tacos and shrimp and the boys had arrachera (we’re still working on their palate). The fresh tortillas were perfect and the freshly squeezed limeades were a big hit among the boys. After a nice dinner we let the boys run around and play in the playground. We didn’t get to use it but they had a nice warm pool and a nice beach front for all the restaurant patrons. If I were to visit again I could probably camp there all day and go from the pool to the beach to the margaritas non stop. 1. Whenever you are driving around the Riviera Maya always always bring your bathing suit, snorkeling gear, towels and sand toys with you. You never know what small beach sanctuary you might encounter and you will wish you had your stuff with you. 2. You can bring snacks, but this is the perfect time to introduce kids to new snacks. Tortillas, fresh fruit and beans can be the perfect snack, and you can find them most everywhere. Otherwise give Mexican Fritos a chance, they are spicy, but oh so good. 3.Diapers, on the other hand, not so easy to find in the smaller towns. 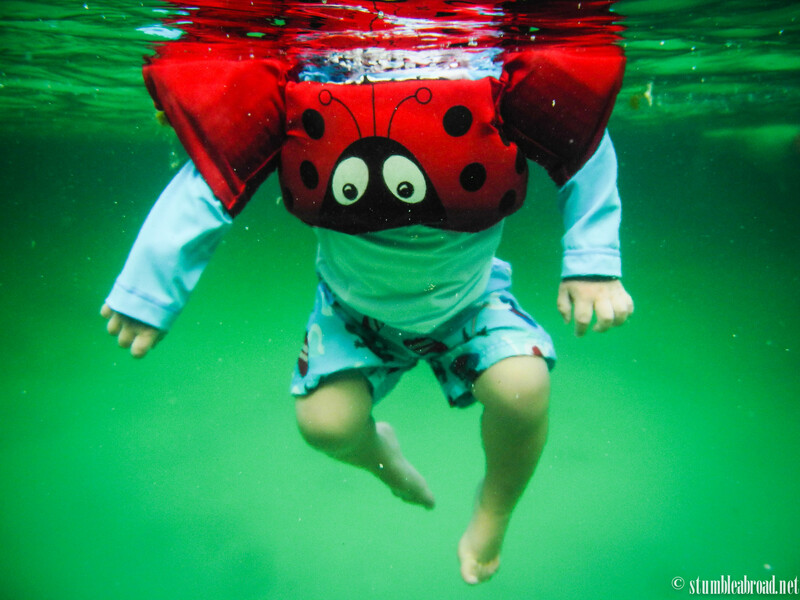 Bring your swim diapers, wipes and regular diapers with you. Diaper accidents do happen and you don’t want to have to return to the hotel if you are already out and about. 4. 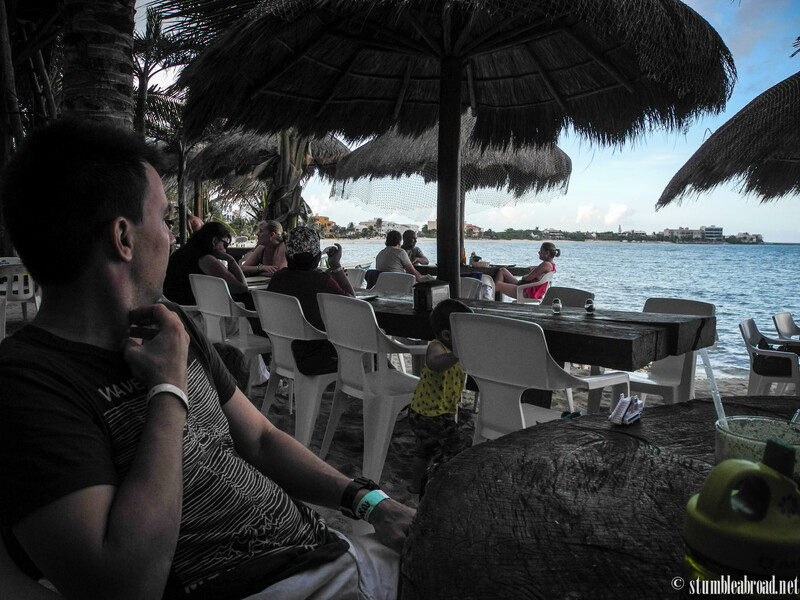 Akumal is a very nice and relaxing spot to spend the day. 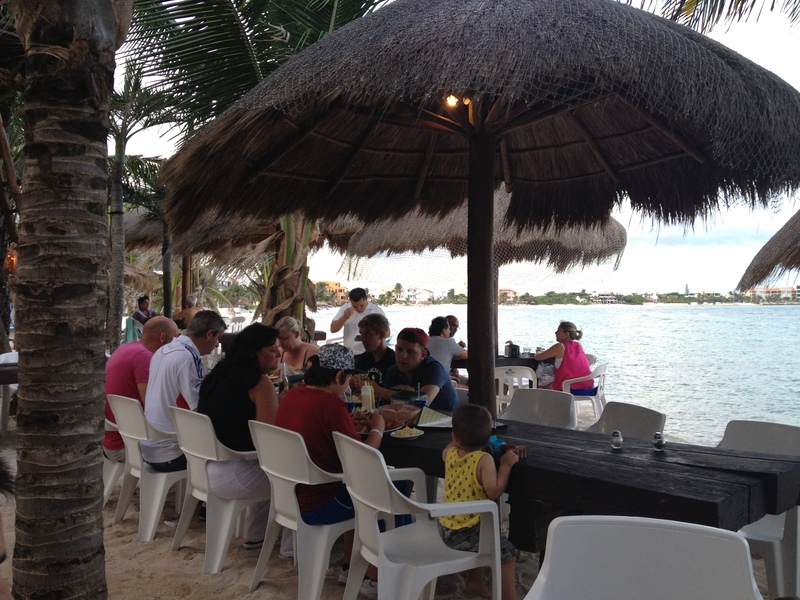 Bring your gear and go to Akumal beach for the day. 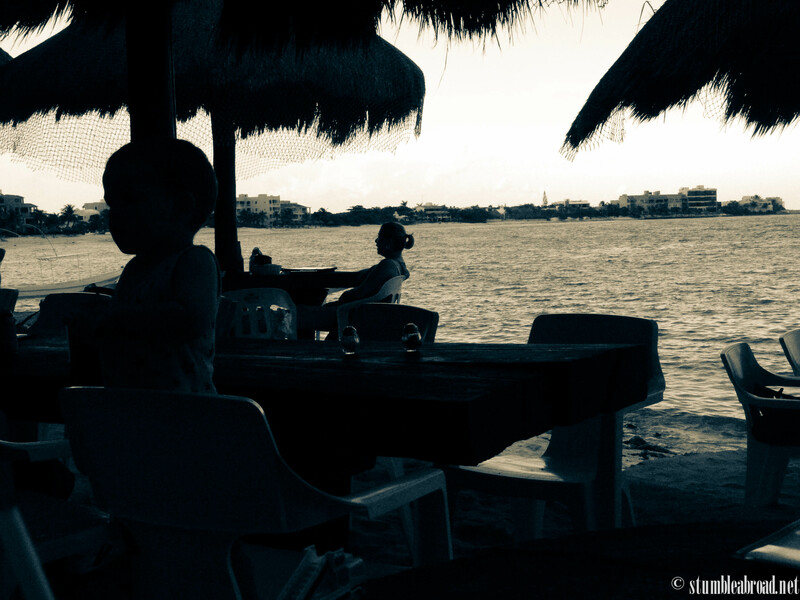 Getting away from the hustle and bustle of Cancun and Playa del Carmen can be a nice treat. 5. 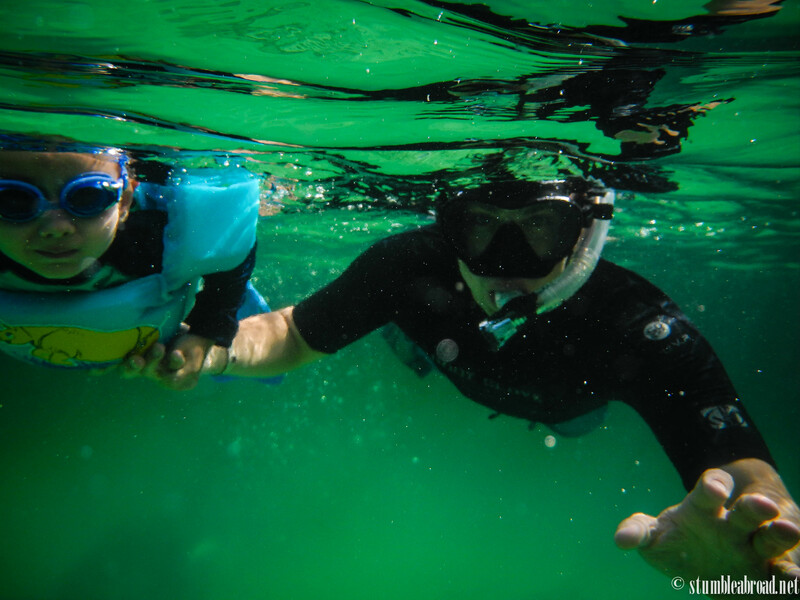 Let the kids snorkel! Evan has a mask and snorkel but he wasn’t completely comfortable wearing them so I stopped insisting, and he was happy just wearing his goggles and lifting his head to breathe. He was so excited to see the fish and loved looking at the coral reefs.